Our retailers often feature Flexsteel furniture on their own websites. Check out their brick-and-mortar locations to get the most up-to-date information on product pricing and availability. Visit Find Flexsteel for information on retailers nearest to you. All product information is available on Flexsteel.com. Product pages provide full product details and color photos that let you zoom in on details. I want to buy a specific piece of furniture, but the store near me said they don’t have it. What do I do? 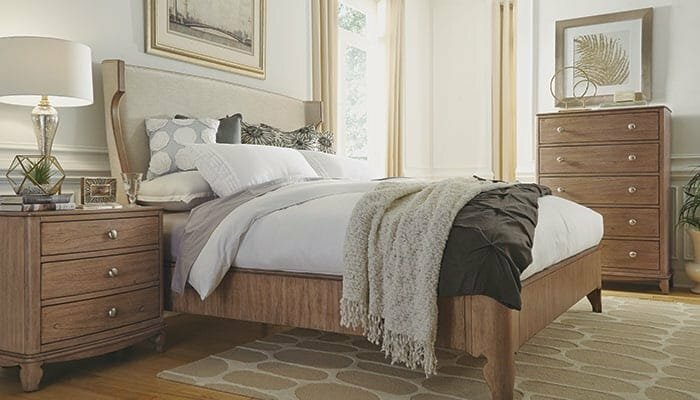 Some retailers do not carry the full line of Flexsteel home furniture, but another retailer may have the piece you’re looking for. Please inquire with a few nearby locations. Visit Find Flexsteel for information on retailers nearest to you. Can I get upholstery swatches? We recommend that you work with a local Flexsteel furniture retailer to see the full range of upholstery colors and options available. Our retailers will share their expertise on important differences in upholstery durability and cleanability to help you make the best choice for your furniture. Visit Find Flexsteel for information on retailers nearest to you. Does Flexsteel offer re-upholstery service, or can you refer me to a reputable re-upholstery company? I need to purchase upholstery to match my Flexsteel furniture for a repair or for accent pieces. How do I go about purchasing Flexsteel upholstery? Flexsteel furniture retailers are happy to check the availability of upholstery and place your order for you. Visit Find Flexsteel for information on retailers nearest to you. How do I know if a necessary repair is covered by the Flexsteel warranty? And, how do I make arrangements to get my Flexsteel furniture repaired? Please provide a report of any defects along with proof of purchase as soon as possible to the Flexsteel retailer where your furniture was purchased. Your retailer will determine if a needed repair is covered under the warranty and make arrangements. If the damaged furniture is more than a year old, you will be responsible for covering shipping and labor costs incurred in repair. The store I bought my furniture from isn’t there anymore. Who do I contact if I have a problem with my furniture? In the case where it’s no longer convenient to work with your original furniture retailer, you can arrange warranty service through any authorized Flexsteel furniture retailer by providing proof of purchase. Visit Find Flexsteel for information on retailers nearest to you. Where is the warranty information for my furniture? Please visit the Warranty page. What is covered under the Flexsteel reclining mechanism lifetime limited warranty? It is rare that a Flexsteel reclining mechanism would exhibit a defect in materials or workmanship, but if this does occur, it is covered under the lifetime limited warranty. Warranted issues include broken or sheared pivot rivets, broken cross tubes that connect the two hinges, or broken mechanism links. Please check with your local Flexsteel retailer or visit the Warranty page for more details. Visit Find Flexsteel for information on retailers nearest to you. Visit Find Flexsteel for information on retailers nearest to you. Please contact your local Flexsteel retailer. Visit Find Flexsteel for information on retailers nearest to you. Can Flexsteel reclining mechanisms be serviced or replaced? Flexsteel reclining mechanisms require no maintenance and will last the lifetime of the furniture! On occasion, mechanisms can become bent from rearranging furniture, sitting on the arm(s) or footrest(s), or general overloading of the furniture. We understand this happens, so replacement mechanisms are available for purchase through your retailer, and replacing the mechanism is a simple repair. How can I check on the status of my furniture repair work or my furniture order? How should I close the footrest on my handle-activated reclining furniture? When closing the footrest on Flexsteel handle-activated reclining furniture, simply press downward with your feet to close the footrest. The reclining handle may be used to assist the closing, but be sure to initiate the first two to three inches of closing with the downward pressure of your feet. Using the handle to initiate the closure of the footrest will result in damage to the reclining mechanism. Please refer to our Flexsteel Power Reclining Operating Instructions. If your reclining furniture features the MyRecline F4 mobile app, please refer to the MyRecline F4 User Manual. How do I select the right fabric for my home furniture? All Flexsteel fabrics are classified for durability by the American Society of Testing and Materials. All fabric samples are coded with a one of four wearablity codes: HHH, MMM, LLL, or DDD. Descriptions of these codes are listed below. HHH – This fabric is rated HEAVY DUTY and is suitable for normal use; by an active family with children. It should provide better durability than fabrics coded as Medium Duty. It meets or exceeds 15,000 Double Cycles of Abrasion Testing. MMM – This fabric is rated MEDIUM DUTY and is suitable for normal use by adults in a household where furniture is not in constant use. It meets or exceeds 9,000 Double Cycles of Abrasion Testing. LLL – This fabric is rated LIGHT DUTY and is suitable for an adult household where furniture is selected for its aesthetic value rather than for its performance characteristics. Such a fabric will provide satisfaction if not subject to constant use. It should provide better durability than fabrics coded as Delicate but cannot be expected to provide the same level of performance as those fabrics labeled as Heavy Duty or Medium Duty. It meets or exceeds 3,000 Double Cycles of Abrasion Testing. DDD – This fabric is rated DELICATE. It is primarily decorative and should be given more care and respect than fabrics coded as Heavy Duty, Medium Duty, or Light Duty. This fabric carries the minimum rating of acceptability as established by the Upholstery Fabric Industry Performance Standards approved by the American Society of Testing and Materials. Note: These codes do not by themselves constitute a guarantee of durability for a specified period of time; however, the fabric has been tested and meets the Upholstery Fabric Industry Performance Standards approved by the American Society of Testing and Materials (ASTM D13-73-12). They meet or exceed standards concerning: breaking;and tearing strength; resistance to yarn slippage; resistance to change in appearance, hand and character; fabric shrinking; crocking; and staining and color fastness to light, water, and gas fumes. How should I clean my Flexsteel fabric furniture? All fabrics in the Flexsteel line are classified for cleanability according to the AHFA cleanability code. For the customer’s convenience, all Flexsteel furniture, except Latitudes Collection furniture, is shipped with a cleanability code on the fabric. Please contact an authorized Flexsteel Latitudes Collection retailer for fabric cleaning codes on Latitudes Collection furniture. Visit Find Flexsteel for information on retailers nearest to you. Flexsteel recommends that your Flexsteel furniture be cleaned by professional upholstery cleaners only. Contact the IICRC at www.iicrc.org to find a certified firm that specializes in upholstery cleaning. W – Spot clean only with water based shampoo or foam upholstery cleaner. Pretest a small, inconspicuous area before proceeding. Do not over wet. Do not use solvents to spot clean. Pile fabrics may require brushing with a non-metallic, soft-bristle brush to restore appearance or reset nap. Cushion covers should not be removed and laundered. Loose cushions feature a zipper closure, but this is to provide a clean finish only. Zippered covers should not be removed and laundered. To prevent overall soiling, frequent vacuuming or light brushing with a non-metallic, soft-bristle brush to remove dust and grime is recommended. When cleaning a spill, blot immediately to remove spilled material. Evenly clean the entire panel in a seam-to-seam fashion. Do not clean just the spots or stains. S – Spot clean only with a water-free dry cleaning solvent. Pretest a small, inconspicuous area before proceeding. Do not saturate. DO NOT USE WATER. Pile fabrics may require brushing with a nonmetallic, soft-bristle brush to restore appearance. Cushion covers should not be removed and dry-cleaned. Loose cushions feature a zipper closure, but this is to provide a clean finish only. Zippered covers should not be removed and dry-cleaned. W/S – Spot clean with upholstery shampoo or dry cleaning solvent designed for furniture. Pretest a small, inconspicuous area before proceeding. Do not saturate. Pile fabrics may require brushing with a non-metallic, soft bristle brush to restore appearance. Hot water extraction or steam cleaning is not a recommended cleaning method. Cushion covers should not be removed and laundered or dry-cleaned. Loose cushions feature a zipper closure, but this is to provide a clean finish only. Zippered covers should not be removed and laundered or dry-cleaned. X – To prevent overall soiling, frequent vacuuming or light brushing with a non-metallic, soft-bristle brush to remove dust and grime is recommended. Water-based foam or solvent-based cleaning agents of any kind may cause excessive shrinking or fading. What is fabric pilling, and how do I remove it? Pilling is characteristic of many fabrics and is caused by excess fiber coming off the fabric surface. This excess fiber forms small balls or “pills” on the fabric. Pilling will persist until the excess fiber has been released. The best treatment is to simply shave the fabric with a battery-operated furniture or sweater shaver to remove the pills and restore the look of the fabric surface. Note: Pilling is not warranted by fabric mills or by Flexsteel. Pilling is a normal characteristic of many fabircs, and it is not considered a defect. How should I clean my Flexsteel leather furniture? We recommend dusting your leather furniture weekly with a soft, clean cloth or vacuuming with a soft brush attachment. Does Flexsteel furniture use fire-retardant chemicals in its foam? No, Flexsteel home furniture is free from fire-retardant chemicals. Flexsteel fabrics introduced after January 1, 2015, meet California TB 117-2013 flammability standards. Does Flexsteel Furniture contain Formaldehyde? No, all Flexsteel furniture is CARB (California Air Resources Board) compliant. Also, all our finishes are lead free. Our furniture comes from all across the United States and the world. Please check with your local Flexsteel retailer for more information. Visit Find Flexsteel for information on retailers nearest to you. Where can my furniture be shipped? We do not ship directly to customers. Please contact your local Flexsteel retailer. Visit Find Flexsteel for information on retailers nearest to you. Delivery arrangements vary according to specific retailers. Visit Find Flexsteel for information on retailers nearest to you. Please contact the retailer where your furniture was purchased for up-to-date information on your order. How can I check on when my furniture will be delivered? Please contact your retailer for delivery status updates. Individual Flexsteel retailers have their own return and exchange policies. Visit Find Flexsteel for information on retailers nearest to you. Can I cancel an order for a custom-order item? Generally, there is a no-cancellation policy for custom-order items. Please check with your local Flexsteel retailer. Visit Find Flexsteel for information on retailers nearest to you. Please contact your Flexsteel retailer if you have an issue with your furniture and to discuss the return policy. Visit Find Flexsteel for information on retailers nearest to you. What if my item(s) does not look like what I saw online? Please contact your Flexsteel retailer to address this issue. Visit Find Flexsteel for information on retailers nearest to you. What if my items do not fit in my home upon delivery? What is the standard delivery window for custom-order furniture? We usually require 10 to 12 weeks to complete and ship your custom-order delivery. Please contact your retailer for delivery status updates. What if I need my order to be expedited? Please check with your local Flexsteel retailer. We don’t ship directly to customers, so please contact your local Flexsteel retailer for details. Visit Find Flexsteel for information on retailers nearest to you. Do you offer services for interior designers? Sorry; we currently don’t offer services for interior designers, but we’re always thinking of new ways we can help. Please Contact Us if you have a specific request or would like to share your ideas. What is Save for Later/Favorites? This feature allows you to view our entire in-line offering and save some of your favorites. Then the next time you visit our site you're able to access those items you selected from your previous web session. Where do I go for product information, dimensions, and care instructions? All available information is on Flexsteel.com. For brand-new products that are not listed online, please contact your local Flexsteel retailer. Visit Find Flexsteel for information on retailers nearest to you. I'm looking for a specific fabric/leather for my piece of furniture; where can I find it? View the Fabric/Leather search page here. What if I don't see the exact furniture size, configuration, or material I need? Please contact a Flexsteel authorized retailer to discuss furniture styles and customization options. Visit Find Flexsteel for information on retailers nearest to you. Are all of your products listed on this website? We update our products frequently, so brand-new items will appear on the site quickly. Where can I find out about Flexsteel furniture events? View the Flexsteel News & Events page. Please email webmaster@flexsteel.com to report any website issues. Why is there no dust cover under Flexsteel furniture? You’ll find our namesake Blue Steel Spring at the core of our upholstered seating. We are so proud of its strength and beauty, we don't want to cover it up. We want to show it off! Can I order a slipcover for an existing Flexsteel piece? Sorry; we do not produce slipcovers for Flexsteel furniture. Sorry; we don’t offer those. I am a retailer; how do I get Flexsteel product in my store? Can I buy furniture directly from Flexsteel? We offer several options to retailers. Please visit our Retail Opportunities page. How do I find out the retail price of furniture? We do not offer suggested retail pricing.